By Dan Ambrose: Once promising super middleweight Mads Larsen (50-2, 37 KOs) won a dull eight-round unanimous decision over journeyman fighter Ross Thompson (26-12-2, 16 KOs) on Saturday night at the Sparkassen-Arena, Kiel, in Schleswig-Holstein, Germany. Larsen, 35, thought to be the next opponent for IBF super middleweight champion Lucian Bute, did little other than jab for most of the fight, and won an uninspiring decision. There was little suspense of the fight, other than the 8th round when Thompson tagged Larsen with a powerful left and right hand shot, backing him up and causing him to cover up on the ropes. Thompson, who had lost eight of his last eleven fights going into Saturday’s bout, didn’t have the size or the firepower to finish Larsen off in the round. The final judges’ scores were 79-73, 80-73 and 80-72, all for Larsen. Larsen, a southpaw from Denmark, who was making only his fifth fight since his comeback in boxing in 2007 after a four year retirement, did little other than jab in the 1st round of the fight. Occasionally, he’d throw a left hand but only when he was certain that Thompson wouldn’t return anything that could give him trouble. Larsen needed have worried, though, because Thompson did absolutely nothing in the first round except pose and try and stay out of range. At 5’9”, Thompson looked considerably smaller than the 5’11” Larsen, and did nothing to try and make up for his lack of height by trying to get in punching distance. In the second round, Thompson attempted to throw a few more punches, but only half-heartedly as he often came up short, seeming not to want to get close enough for Larsen to hit him with a counter punch. From a distance, Larsen looked eerily similar to fellow Dane Mikkel Kessler, who also has a large tattoo on the side of his right arm, but that’s where the similarity ends. Larsen immediately showed that he had almost zero power and none of the speed and ring craftiness that Kessler has. Even in his prime, four years ago against Sven Ottke, Larsen was mostly a jabber, which cost him in that fight as he lost a 12-round majority decision. Sadly, nothing has changed since then for Larsen, except maybe he doesn’t throw quite as many jabs as he used to. He doesn’t, however, make up for it by throwing left hands or right hooks. 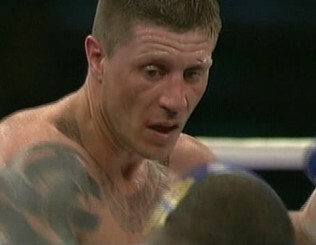 Larsen was cut over his left eyebrow in the third round after clashing heads with Thompson. Perhaps encouraged by the sight of blood, Thompson finally started letting his hands go a little and landed a small number of right hands in the round. It was still mostly all Larsen, who controlled the round with his jab, which he frequently threw at Thompson. In the sixth round, one good punch was thrown, a left hand by Larsen that caused Thompson to briefly stumble and almost fall. He wasn’t hurt, however, just off balance. It probably wouldn’t have mattered even if he had been hurt, for Larsen wouldn’t have gone after him regardless because he was fighting purely in a safety-first style and didn’t want to take any chances. Both the 7th and 8th rounds were more of the same, with Larsen jabbing and Thompson doing little other than posing on the outside. Near the end of the 8th round, Thompson finally woke up and tagged Larsen with a nice combination, driving him to the ropes. Thompson, however, couldn’t put his punches together to follow up with anything meaningful and subsequently left Larsen off the hook. I doubt he would have been able to do anything, however, because Larsen had been placing Thompson in a head lock every time he would get near him. Most fighters initiate clinches but with Larsen, he puts them in a mean head lock. To each his own I guess. In the end, Larsen was too good for Thompson, although I’m not in the least surprised considering that Thompson had lost eight of his last eleven bouts going into the fight and one would surmise that he didn’t have a ghost of a chance at winning. I must say, I’m not impressed with Larsen in the least. I think Bute would destroy him quite easily without breaking a sweat. I think Bute aught to reconsider using him as an opponent, for he’ll just turn off a lot of fans by fighting him.